Samsung is definitely a veteran on the smartwatch scene, perhaps even more so than LG. The Korean giant has already done a few experiments in the field, some of which arguably quite successful, but the Gear S2 might just be the biggest one yet. The Gear S2 is radically different from any other wearable Samsung has put out. There is, of course, the obvious fact that it is the first to utilize a round form-factor, but that is just the tip of the iceberg. The new Gear is yet another radical development in Samsung's wearable family that has been frantically moving towards and then away from standardization and the Android Wear OS. While still relying on the custom Tizen platform, the Gear S2 now looks to be more in-line with today's smartwatch trends, as set by Google and Apple. Samsung might have finally found a proper course of development to stay in tune with the general flow, while still working on its own vision and delivering a fresh and alternative, yet somehow familiar experience. The Gear S2 is the first milestone on this new path and it is eerily familiar and surprisingly different all at the same time. First things first, let's talk about version and how they differ. There are three varieties of Samsung's new wearable. The plain Gear S2, which we have here for review, features a fine and uniform finish all around and comes with a silicon band with a proprietary connector. In contrast, there is the Gear S2 Classic, which has a lightly different wheel and uses a standard strap that you can easily swap for an after-market solution. 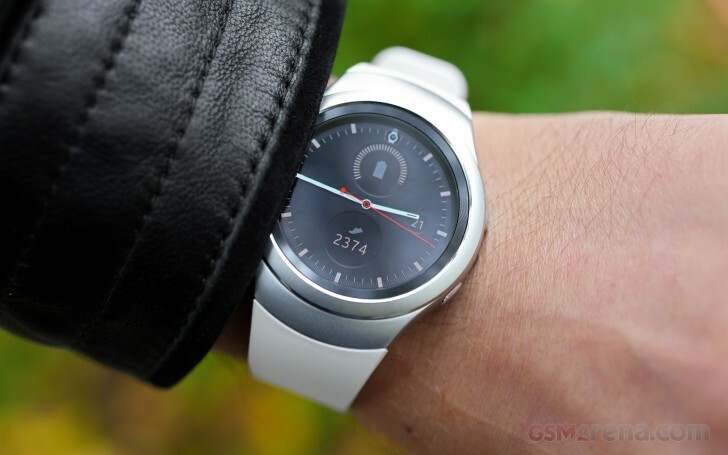 Last, but not least, there is the 3G model Gear S2, it looks practically identical to the plain one, but is overall a bit bigger, bulkier and heavier. It complements the wearable line in much the same way LG Watch Urbane LTE does, but should enjoy broader availability. The name of the watch itself definitely suggests some relation to the Gear S, but apart from the Tizen-based OS, the two devices actually have little in common. As already mentioned, it seems Samsung has decided to draw from its abundant experience in the wearable field and start working towards similar goals as most of its competitors, which are now shaping to be the new direction of the niche and possible, the future of smartwatches as a whole. This all falls in line perfectly with natural tech evolution. Wearables are starting to mature and with that comes a stride towards standardization, compatibility and uniformity. Samsung knows this all too well and is now striding to fall in line with the rest and not be left out in the long run. Still, in a cunning attempt to stick out, the Korean giant has retained its alternative approach to things and this tactical mixture might actually be a genius move in a market where differentiating using Android Wear OS is highly challenging. Follow us to the next page and we'll find out how well this has worked. Does it work with a Sam. J2?